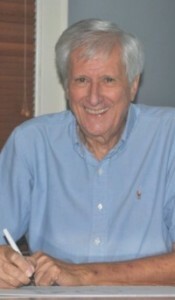 Kenneth G. Gilbert holds a BA and MA Degrees. He has been an active artist and art educator in the Parkersburg, West Virginia area during his professional career. He has taught on the elementary, junior high, senior high and college levels. He also served as art coordinator for the Wood County School System for 27 years. He owned and was art director of Iron Gate Studio in Parkersburg for several years. Other professional achievements include founding and directing the Mountain Trace Folklore Program at Parkersburg High School where his students interviewed older West Virginians and compiled three hardbound books on West Virginia heritage and culture. He is author and illustrator of the Blennerhassett Sketchbook and is currently co-authoring and illustrating an Appalachian and Wild Food Cookbook. He was the recipient of a Fulbright Fellow to represent America and teach in England. After leaving the world of education, he was appointed by two governors to serve as West Virginia Human Rights Commissioner.